Researchers examine evidence from a past interglacial period to predict sea level rise in the future. As the climate warms, the Intergovernmental Panel on Climate Change predicts sea level may rise 52–98 centimeters by 2100 because of thermal expansion and melting land-based glaciers. However, this estimate does not account for the instability of sub–sea level portions of the West Antarctic Ice Sheet since there has been too much uncertainty about how the ice sheet will respond to rising temperatures. A new study suggests that the ice sheet may not disappear completely, but over the next 3 centuries it could melt enough to make the oceans rise 3.3 meters. “It seemed to us one way to look at the problem was to go and see what happened in the past when you had these warmer periods,” said David Sugden, professor of geography in the School of Geosciences at the University of Edinburgh in the United Kingdom. Sugden was a principal investigator on the study, which was published in Nature Communications last week. The researchers investigated three mountains protruding from a portion of the ice sheet in the Weddell Sea embayment spanning about 50 kilometers by 25 kilometers. Although models had been created to hypothesize how much of the ice sheet may have disappeared in past cycles of glacial retreat, theirs was the first study to procure hard evidence for the extent of loss. Sugden and the team scoured the region for blue ice moraines—areas of ice and rocky debris brought to the surface when new ice flows upward after winds strip away the surface ice. They then performed a cosmogenic isotope analysis on the moraines to determine how long they had been exposed to cosmic rays and therefore how long they had been on the surface of the ice sheet. The more cosmogenic nuclides were present because of interactions between the rock and cosmic rays, the longer the rock had been exposed. In turn, the scientists were able to determine the age of the ice sheet. “What surprised us is the age of the stones,” says Sugden. Some of them had surfaced up to 1.4 million years ago, suggesting the ice sheet in those regions had not melted during previous cycles of glacier growth and decline in the Pleistocene, when there were periods of warmer climate than today. 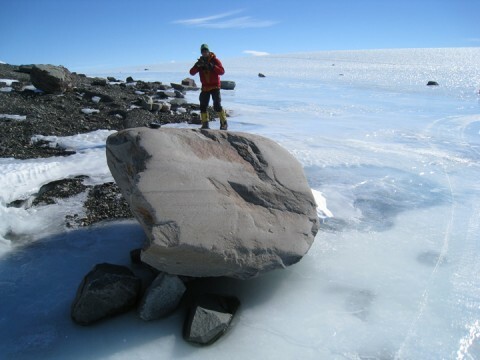 This hinted that the ice sheet had been stable for an extensive period of time. “The careful analyses of cosmogenic ages provide powerful constraints on the stability of the Ellsworth Mountains region of West Antarctica,” said Howard Conway in an email. Conway is a glaciologist at the University of Washington in Seattle who was not involved in the study. The portion of the ice sheet below sea level might have melted during warmer periods. The researchers could tell from the alignment and types of rocks deposited at different elevations that winds caused by air getting cold and therefore descending—known as katabatic winds—were blowing continuously over the mountains for the full 1.4 million years. According to Sugden, katabatic winds indicate that an ice sheet must have been present. “If the ice sheet had collapsed and disappeared and you lost all your ice, you wouldn’t have katabatic winds,” he said. However, the researchers believe the winds could occur as long as an ice sheet remained on elevated regions. In such a case, the portion of the ice sheet below sea level might have melted during warmer periods. This led the researchers to conclude that increased temperature in the coming decades may melt the low-lying portion of the ice sheet. The subsequent rise in sea level might be significant but less drastic than if the entire ice sheet were to melt—raising sea level by 5 meters. Previous studies have found that a large portion of the West Antarctic ice sheet is vanishing, possibly irreversibly. “It’s going alarmingly fast,” says Sugden. Andy Hein of the University of Edinburgh and John Woodward from Northumbria University, both in the United Kingdom, coled the study with Sugden. Citation: Kelleher, S. (2016), Pleistocene rocks tell tale of past ice sheet melting, Eos, 97, doi:10.1029/2016EO045941. Published on 11 February 2016.